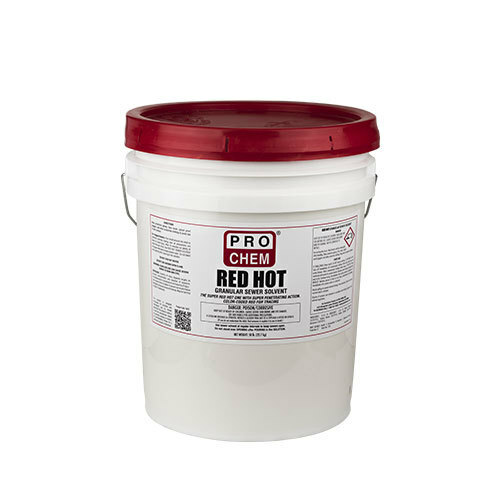 RED HOT | Pro Chem, Inc.
RED HOT is an alkaline granular compound used to open sewers and drains. It is a combination of chemical and metallic chips, which reacts with water to create considerable heat and agitation. This action readily dissolves greasy deposits, leaves and other blockage, which obstruct sewer lines. Reaches maximum temperature in 1 minute 30 seconds (215°F) and sustains temperature of at least 180°F for 7 minutes allowing RED HOT to give complete clean out. FOR USE ONLY IN MAIN SEWER LINES. Do not use in indoor drains, toilets, sinks, grease traps or floor drains. Add only to main sewer manholes. Wear protective gloves, face mask, splash-proof goggles and other protective clothing to avoid eye or skin contact. For Clogged Sewers: Add to manhole closest to the blockage. Pour entire pail into manhole opening making sure all precautions are taken to avoid injury. After 15 minutes, run plenty of water through drain. Do not stand over opening after pouring in product. Not for use in septic tanks.